The latest addition to (what I hope will be) my assorted collection of Horus Heresy Automata is the big daddy of them all. The Thanatar Siege Automata! 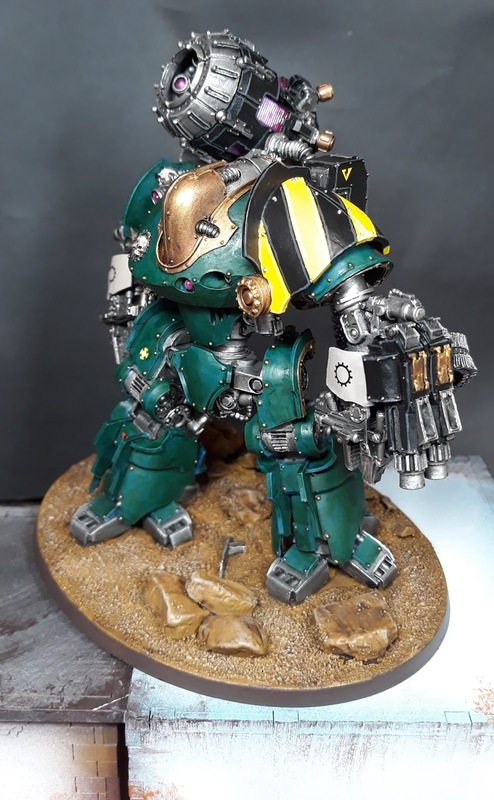 The Thanatar is armed with a Hellex plasma mortar which just might be the best weapon name in the entire 40k universe. I left the mortar off for painting and then glued it on afterwards. As you can see, I went for my usual pink colour for the plasma effect. I laid down some hazard striping on the left shoulder using Tamiya masking tape. 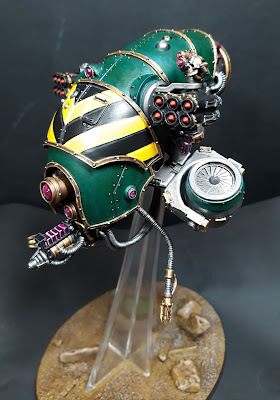 I'm pretty happy with how it turned out and I think I'll carry this through the rest of my 30k models. The model wasn't too difficult to construct. Although bending the twin ammo feed for the bolt cannons did give me some headaches it was easy enough with the application of some hot water and a few pins to hold it in place. Honestly I wish I had used more pins on this model because the ankle joints aren't that sturdy and they could have used some reinforcement. Still, if it breaks I can always drill some pins in during the repair. As you can see, I added a handful of transfers from the Skitarii and Armiger transfer sheets to give a bit of interest. I've really been enjoying transfers lately and I feel it's a shame I didn't use them in the early days of my Adeptus Mechanicus army. Still, every model is an opportunity to expand your repertoire of techniques and I feel I have been able to do that with these. Since finishing the Thanatar (only two days ago) I feel at a bit of a loss of which model to pick up next. 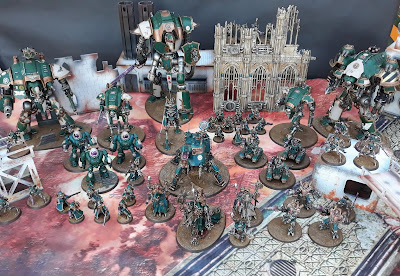 I might do another 30k model or go back to Adeptus Mechanicus and add some more infantry or a Dragoon. Ah well, such is the joy of having an extensive hobby backlog I guess. Tune in next time to see what I decided to do! A bit of an odd one out this week. As some of you may know, I have a bit of a backlog of Mechanicum automata for the Horus Heresy. Well, I decided to start making some headway with it! 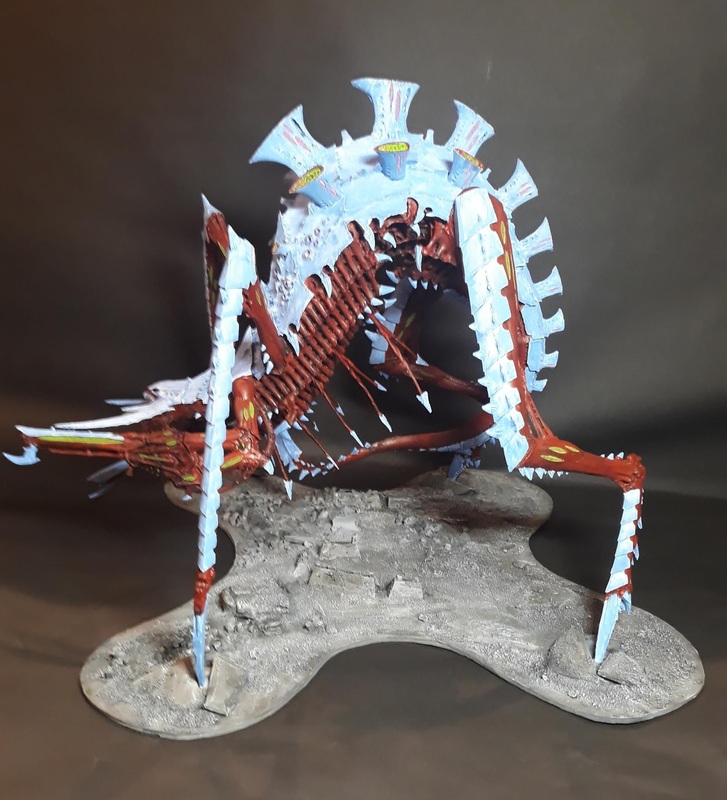 First up, the amazing Vularax Stratos Automata. I just love the Mechanicum units; they're similar enough to the 40k Adeptus Mechanicus stuff that they look good alongside it, but they have a really ancient, mysterious feel to them. 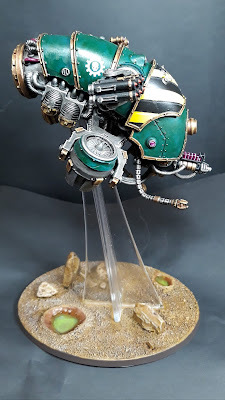 The Vultarax shares a lot of cues with the Nurgle drones but with a more streamlined, less pustulent aesthetic. Basically, I think it's awesome! The Vultarax did prove tricky to photograph though. No matter how I positioned it I couldn't get rid of the annoying glare on the hull. What you see here is the best I could manage. 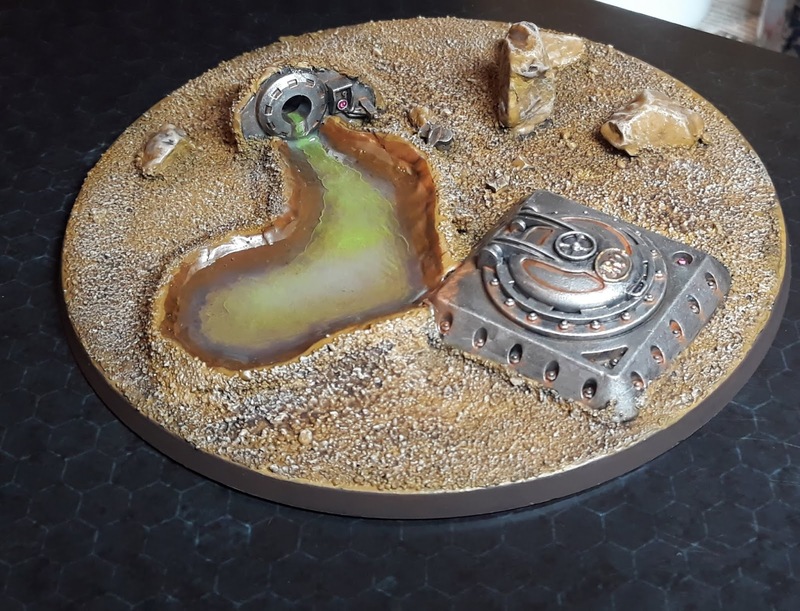 Did a bit of water effect on the base. It was a delightful thing to paint though. I'm really happy with the hazard stripes on the front canopy. So much so that I think I will make them a repeating motif across all my 30k units. That should allow them to look distinct from my 40k stuff whilst still remaining a unified whole when together. 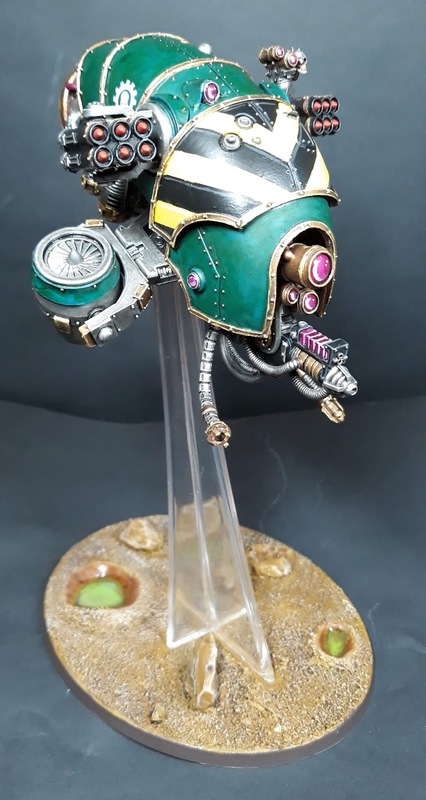 The rest of the scheme is my normal green/brass/pink which I'm sure you're all sick of by now. 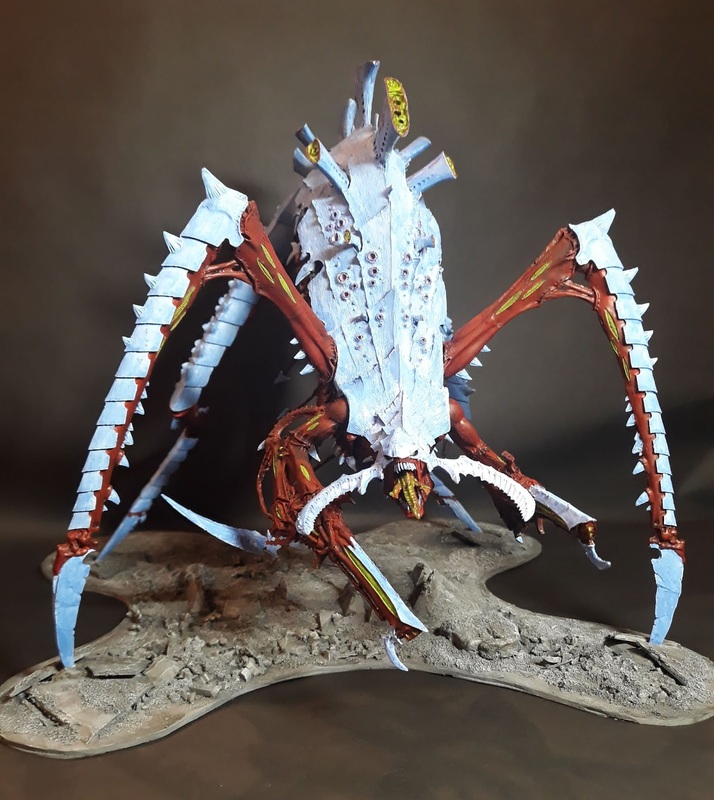 Special mention has to go to the lenses however; the Vultarax is absolutely festooned with them and I really loved painting each and every one. Now, to address the slight stumbling block of this project. 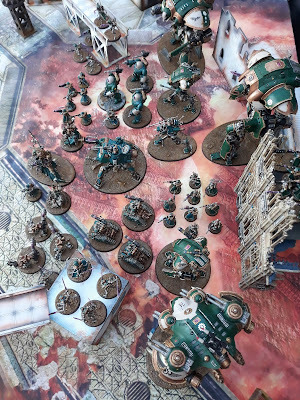 These days I pretty much only play 40k; I don't really have the time to commit to other game systems (much as I would like to) and the Vultarax only has official rules for 30k. Hopefully Forgeworld will release some rules for their Horus Heresy Mechanicum range for use in 40k in the near future. For now, there are some excellent fan made rules available online which my gaming group has agreed to use to allow me to field this thing from time to time. Thanks a lot guys! Anyway, that's about it for the Vultarax. I'm hoping to crack on with some more Mechanicum units and get a few more painted up very soon. 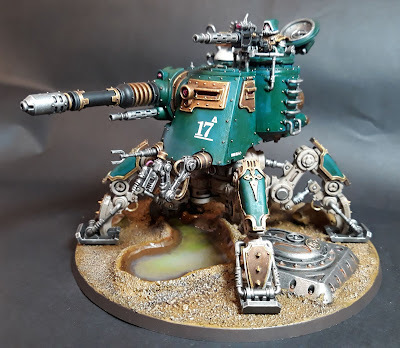 This is actually the Onager from my first Start Collecting: Skitarii set bought way back when. 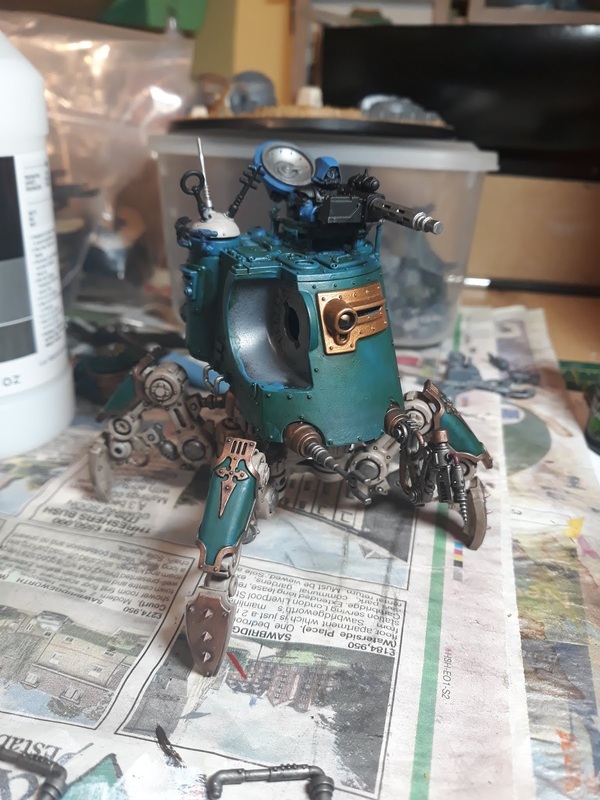 Some of you may know that this is the second Dunecrawler I have painted, the reason for this is that I excitedly started building and painting this model when I first bought it, only to realise quickly that I had made a mistake! I should have built it in sub-assembles for painting and it would have been far easier. After a few shoddy brushstrokes, it was shelved fro a later date. As a result, the half painted model has been part of my army for years. As the rest of the force has grown around it, it began to look more and more of an eyesore. 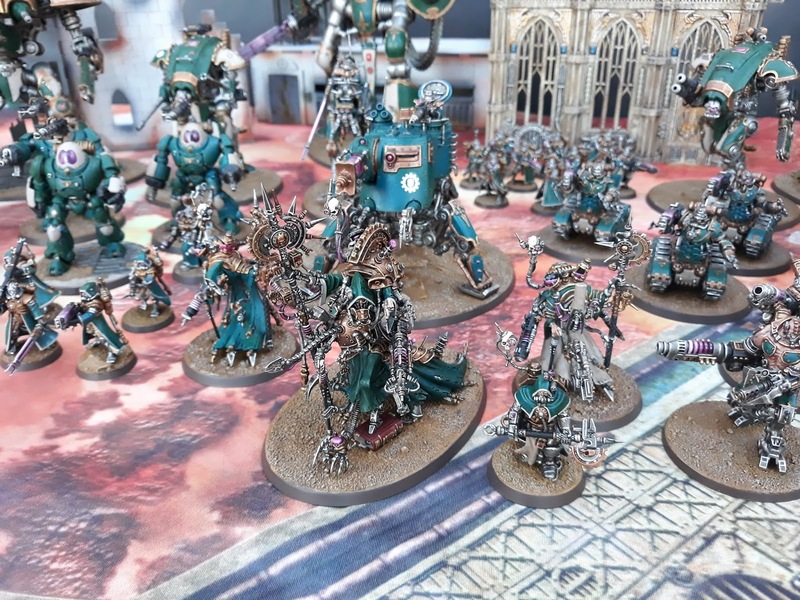 But, with the Mechanicus points drops from chapter approved I was hard pressed to make an army that didn't include it. Thankfully, I managed to push through and get it finished. I also tried something a bit different with the base on this one. I attempted to build a kind of toxic waste outflow next to a bunker hatch. 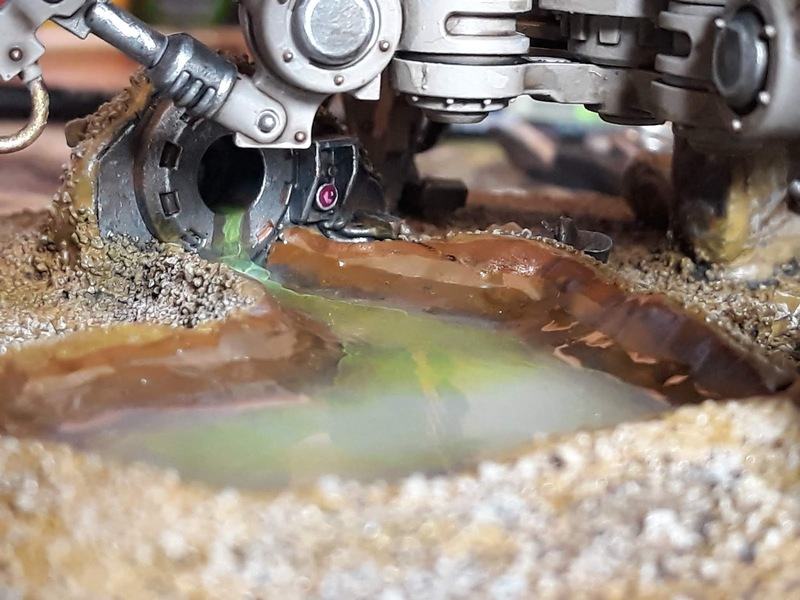 I used some clear pouring medium for a water effect and I'm reasonably happy with how it turned out. I think I will attempt something similar on future projects. The base design was inspired by my friend Anna over at The Ashen Pair. We had some conversations about my sandy bases and she gave me a gentle shove to try something a bit more adventurous. 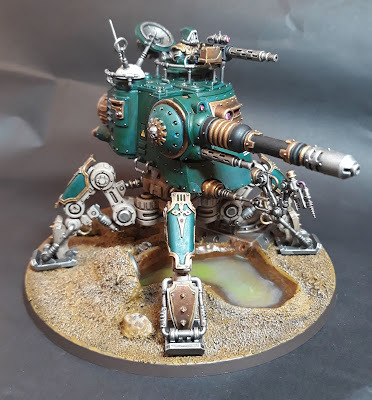 Anyway, another model added to the army and another fun project. 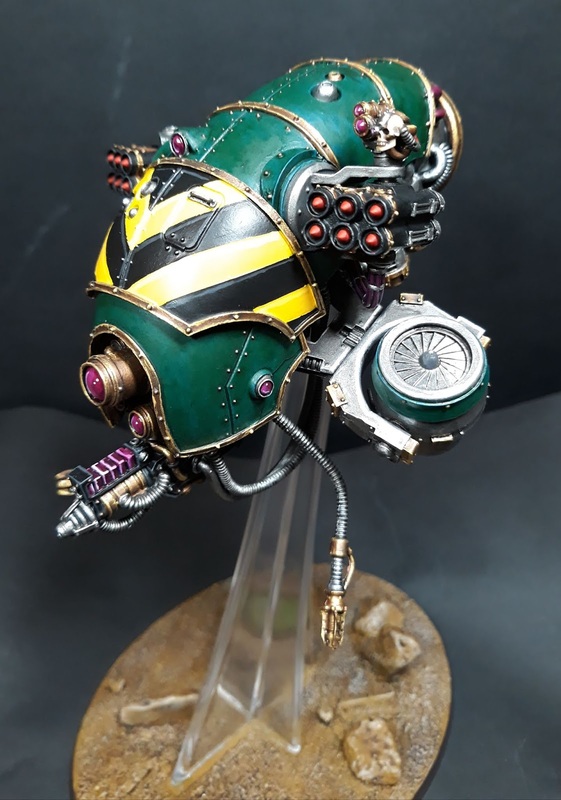 More than anything I'm just really pleased to have this one done and to be able to use it on the tabletop. 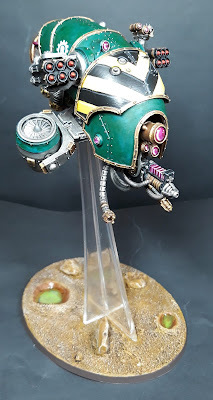 Check in next week to see my next project which is also Mechanicus themed! First off, sorry for the delayed post. This really should have gone up last week as part of Monster March but some things got in the way. Namely, finding the right space to take some half decent photos of this massive beast! Now that's a big bug! The Hierophant has actually been quite a relaxed project to work on. 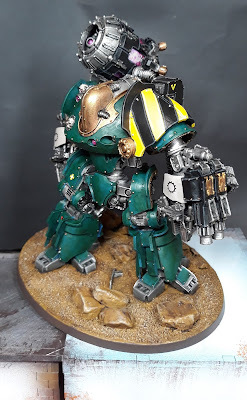 Partially because it is such a simple paint scheme (see my previous post) but also because it was part way finished when I kicked off this month; so it has felt easier than having to start from scratch. However, we're only about half way through March, so I feel like I should add another model to the Monster March challenge run by Path of an Outcast. Unfortunately I don't have another suitable monster (and let's be honest, what could follow the Hierophant?) so I'm following the theme of getting things finished off. 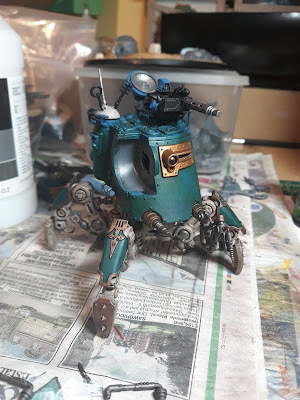 Without asking permission, I'm going to chuck in an Onager Dunecrawler that I started painting about two years ago but never finished. It's in a bit of a sorry state and will need some TLC to bring it up to scratch. Here's the current state of things. Why oh why didn't I part assemble it?? So, it needs a lot of work. The painting is shambolic and it needs a base, feet, a gun and lots of hugs and kisses. I have done a bit of work on it to even get it to this stage. The legs have been cleaned up and I'm fairly happy with how they're progressing. That upper hull though........ugh. Anyway, tune in next time to see if I've manage to make a beauty out of this beast! It's March once again and that means time for Monster March! This is an annual painting challenge run by Swordmaster over at Path of an Outcast. 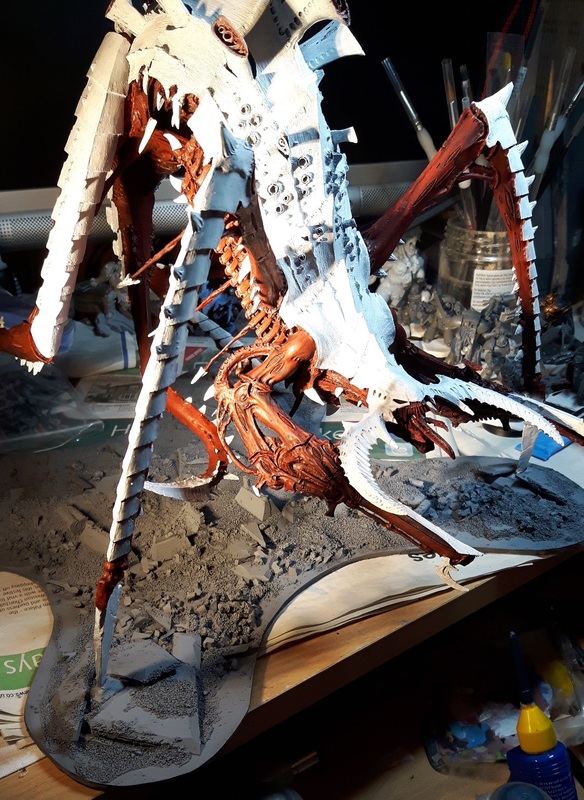 Once again I'm thrilled to participate with another huge model; this time, trying to finish off a Hierophant Bio-Titan for my Tyranid army. If you read my previous post, you will know that I had made a start on this beast a couple of years ago; but had never gotten around to completing the model. Well, it's time to change all that! As you can see from the above, I've made great progress this week; getting a lot of the base colours finished off and starting to add detail. 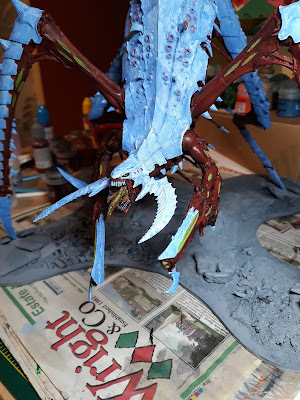 It's been interesting to go back to a Tyranid after painting so many Adeptus Mechanicus models recently. My Tyranid colour scheme was created over a decade ago and was designed for a novice painter (me) to get reasonable looking models on the field quickly. I haven't been able to change the scheme much over the years because it would create disparity within the army. 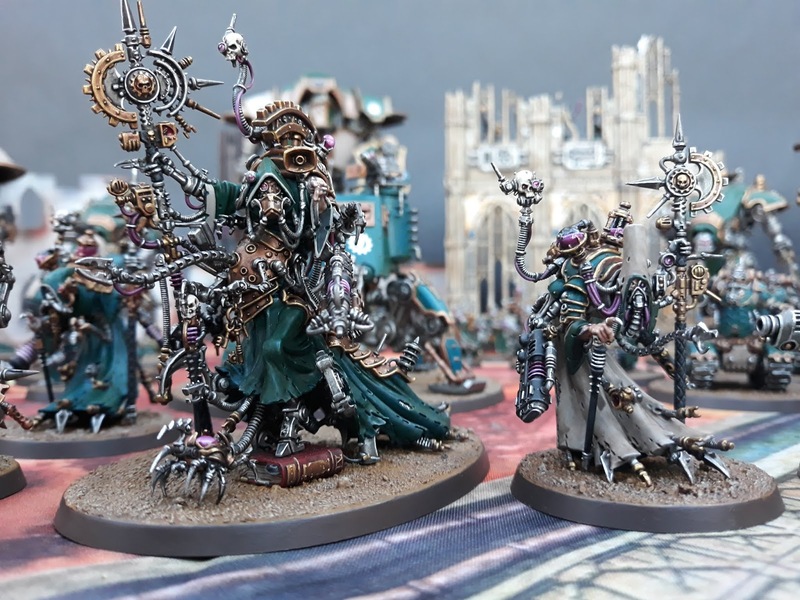 So, what you see on the Hierophant is a pretty basic paint scheme. On the one hand it's nice to paint something so simply and be able to make lots of quick progress. On the other, it's frustrating not to be able to apply skills that I've learned over the last ten years. 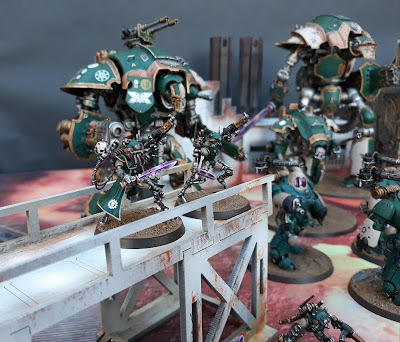 Nevertheless, it's a bold, bright scheme and looks good on the tabletop. So I'm not too miserable about it. I'm always amazed at the size of this thing. In terms of progress, there's not too much left to do. Basically details to paint, a few areas to touch up and that big old base to deal with. If I have a good week next week it might even be finished by my next post! Then I will have to deal with the problem of trying to properly photograph a model this size! Tune in next week to see how I'm getting on and if I decide to add a second model to the Monster March pledge. If you've been hanging around here long enough (you poor souls), you may recall my ill advised foray into the world of titanic units. Specifically the Hierophant Bio-Titan. Basically I made a start painting the thing about two years ago but it never got finished; you can read more about that escapade here. Basically the state of things right now. 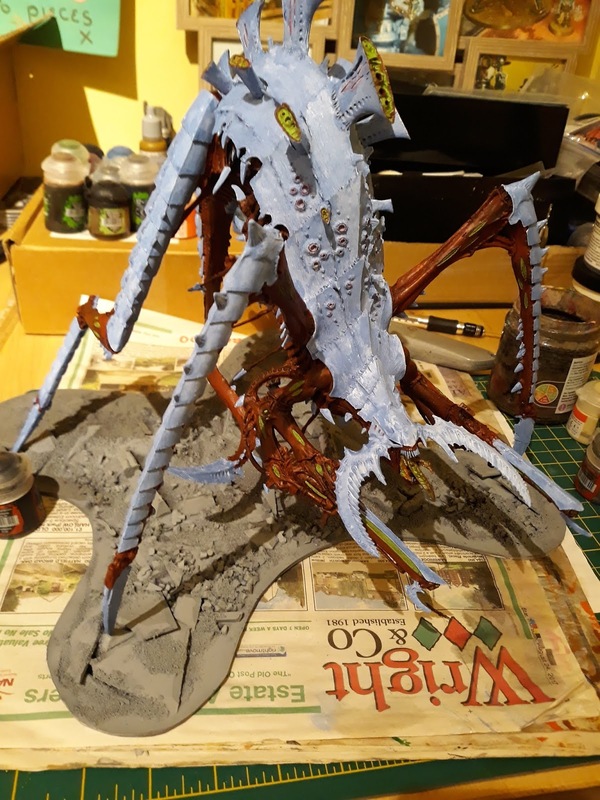 As you can see from the photo, I banged a few basecoats on it (no mean feat with a beast this size) and that was as far as it got. Well, it's March and that means Monster March! 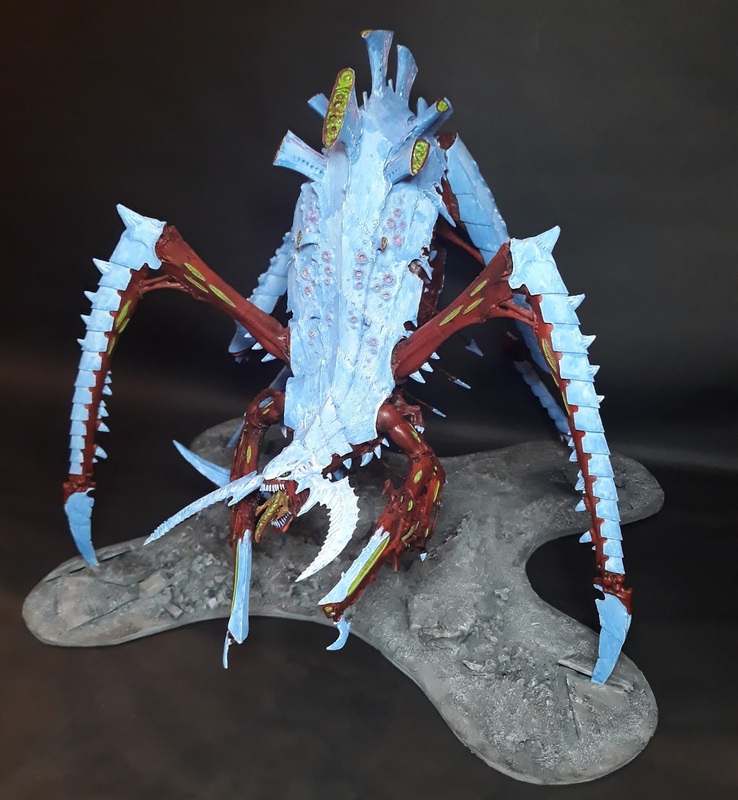 Run by Path of an Outcast, this event is meant for participants to build and paint (or otherwise finish off) a suitable monster within the month. So, my intention is clear, I will finish painting the biggest of all monsters for this month's pledge! Tune in next week for an update and to see if my paintbrush has been worn down to a nub. 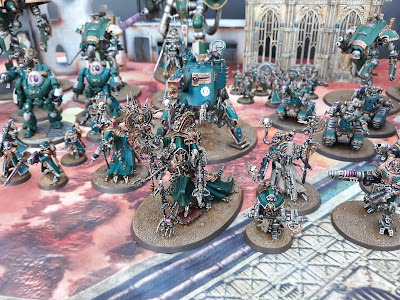 The Grand Army of the Mechanicus! I've been meaning to post up some photos of the current state of my Adeptus Mechanicus forces for a while and finally got the chance to snap a few over the weekend. Without further ado, I am proud to present, the Grand Army of the Mechanicus! If you read this blog regularly, you will have seen this lot come together over the last couple of years. Currently the army stands at 3500 points and I have plenty more models still to build and paint. The knights have been a great addition to the army. The list is still very top heavy and feels like it needs a lot more infantry. To that end I plan to paint up some more Skitarii, some Electropriests and another squad of Infiltrators. Hopefully that will help balance things out a bit. 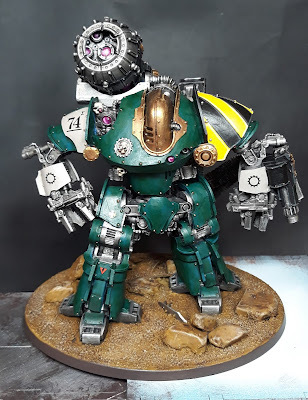 I think the colour scheme has translated well across all the models. The most recent HQ choices in the army. 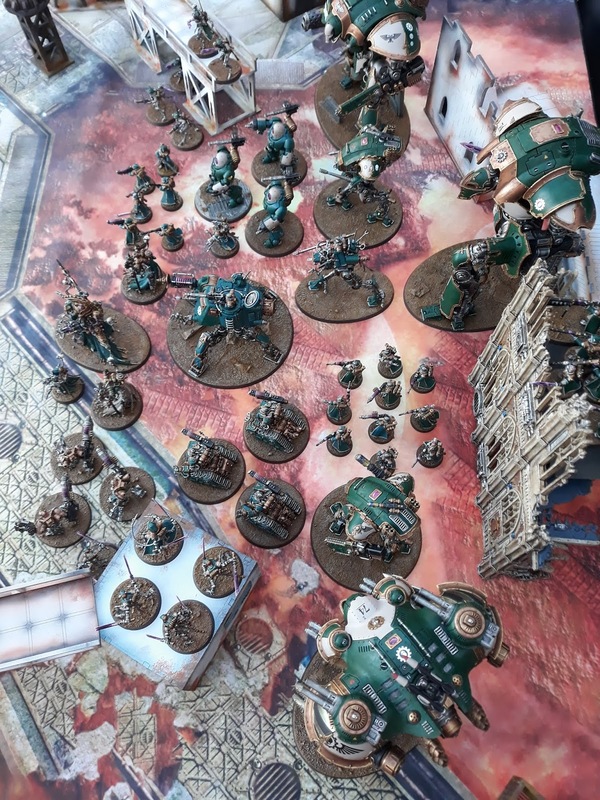 From a personal standpoint; having a large, nicely painted army is something I've wanted for a long time. Ever since seeing the armies displayed in White Dwarf every month when I was a teenager (Fred Reed's Howling Griffons anyone?) So, getting a collection like this together is enormously satisfying. I can't wait to add more to it this year. I have plans to add another Onager or two. 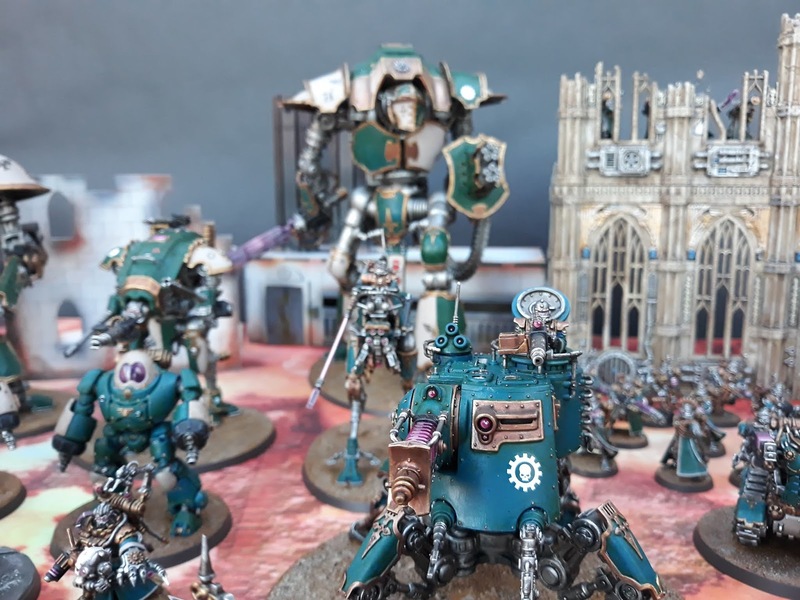 Despite wanting to add many more Adeptus Mechanicus units; the Imperial Knights have been immensely satisfying modelling projects. 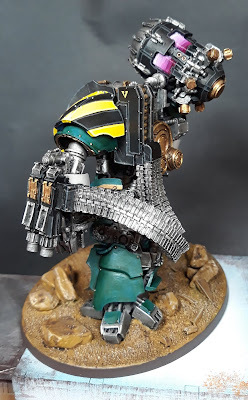 In the queue to be built and painted I have a Cerastus Knight Atropos along with another Armiger Warglaive. 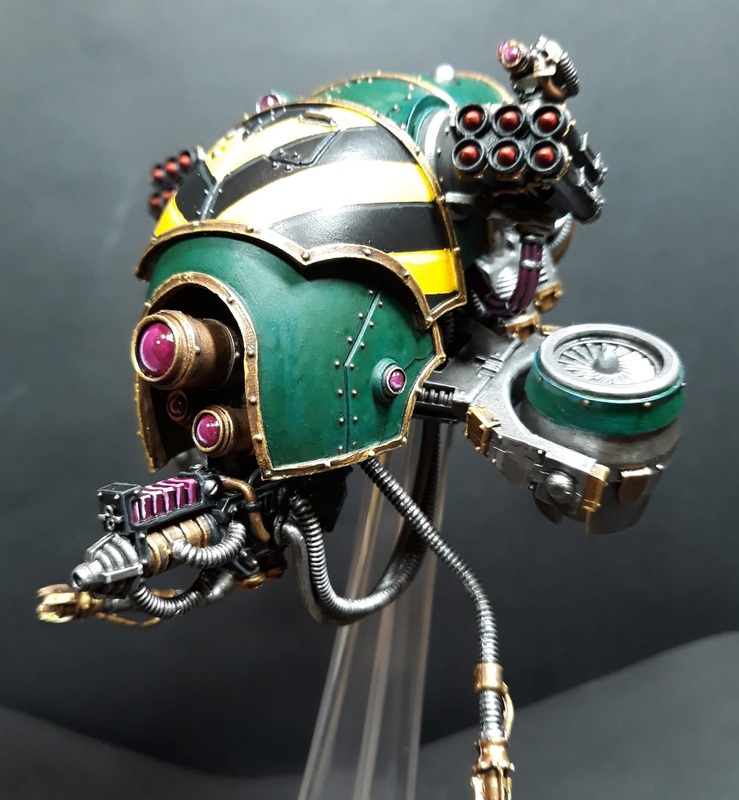 The Atropos in particular I am very much looking forward to because I absolutely adore the model. 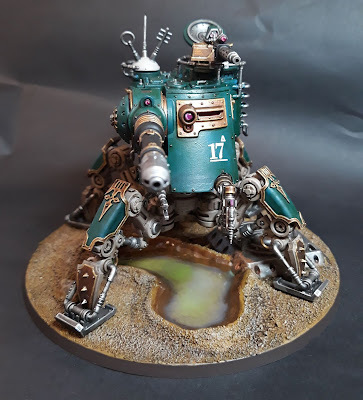 I also have a few Mechanicum 30k robots on the back burner. 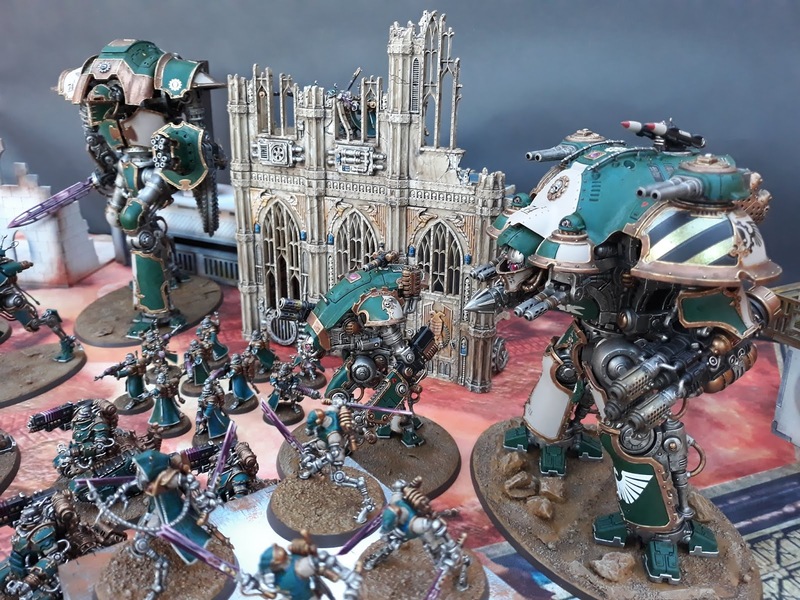 Rumour has it that these will get rules for 40k in the future and it will be excellent to add these gorgeous models to the collection. 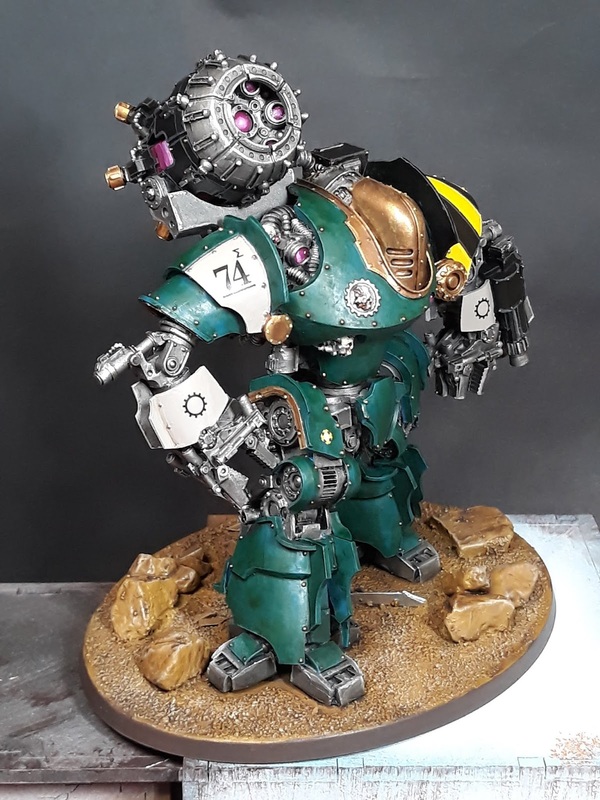 In particular, I have a Thanatar Siege Automata which I would love to have painted. That's a lot of green robots. Anyway, that concludes this little self-indulgent ramble. Here's to the next 3500 points!